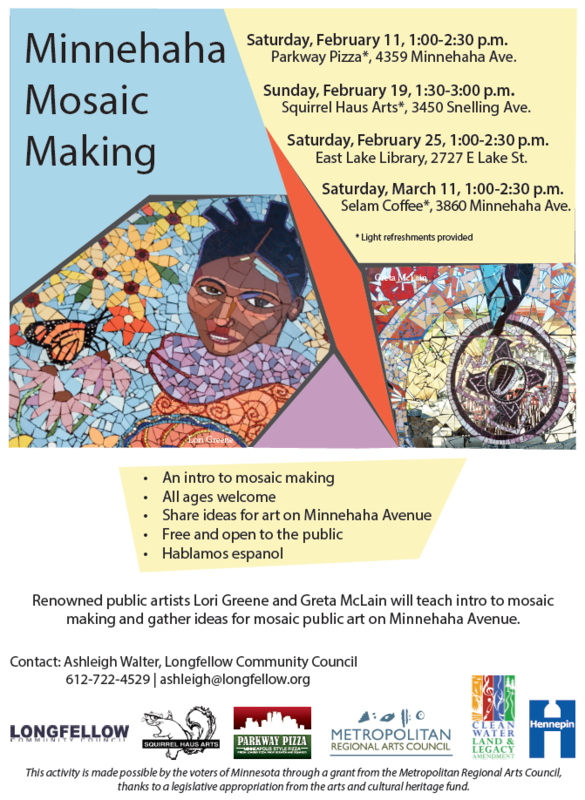 Learn more about mosaic making and share ideas for a public art project on Minnehaha Ave! Thanks to a grant from the Metropolitan Regional Arts Council to The Longfellow Community Council, Minnehaha Avenue will soon have more than a dozen beautiful new mosaic trash cans! Join Hennepin County, local businesses, and community and agency partners to celebrate the completion of Minnehaha Avenue. The November 12th event will start with a community open house at Adams Triangle (41st and Minnehaha Avenue) at 11 am. Refreshments, games, bike-safety checks, and more until 12:30. At 12:30 there will be a group bike ride and tour of the improved Minnehaha Avenue – a chance to check out first hand the new bike lanes, pedestrian improvements, and streetscaping – finishing up at Lake Street near Wilson Law Group. Running all day until 4 pm will be the 2nd annual corridor scavenger hunt — this year the Golden Bicycle Hunt at 20+ businesses along the corridor. Pick up a card at Adams Triangle or any participating business! Return your cards to Adams Triangle for a prize drawing at 4:30 pm! 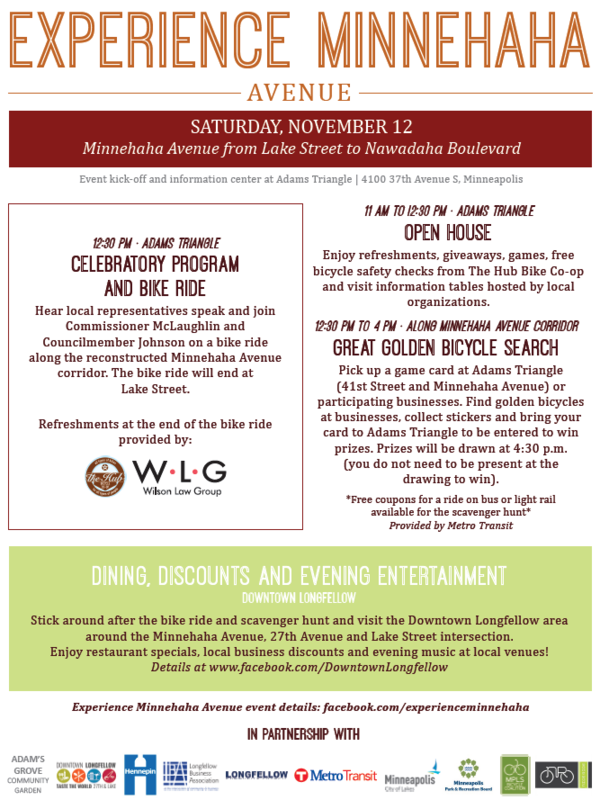 The day will end at Lake & Minnehaha with a variety of specials at Downtown Longfellow area businesses. Check the Experience Minnehaha Facebook page for more information. Construction in the Minnehaha Avenue area enters its final phase on July 5th and will last through fall. Minnehaha Avenue: Construction activities move north to the section between Lake and 34th streets. The road will be closed to through traffic, although a lane will remain open for local access to homes and businesses. Expect some temporary closures of intersections as they are reconstructed – note that adjacent intersections will not be closed at the same time. 38th Street: The City of Minneapolis will be closing 38th Street between Hiawatha and Minnehaha avenues for a full reconstruction of the road. Construction is expected to last three months. Businesses Open! Minnehaha businesses will be open throughout construction, and local access via street and sidewalk will be maintained. Check out the Experience Minnehaha Facebook page for more information on activities and events throughout the summer and fall. 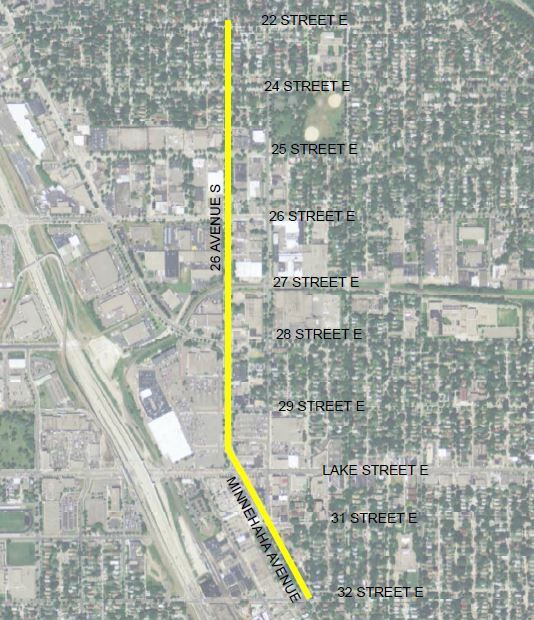 CenterPoint Energy is about to begin an upgrade of natural gas pipeline under Minnehaha Avenue and 26th Avenue from 32nd Street north to 22nd Street. Construction is expected to start the week of May 23rd and take three months. The work is being coordinated with the County’s reconstruction of Minnehaha Avenue. Click the CenterPoint project website for more information. The new street furniture should be showing up along the southern portion of Minnehaha Avenue within the next month or so. 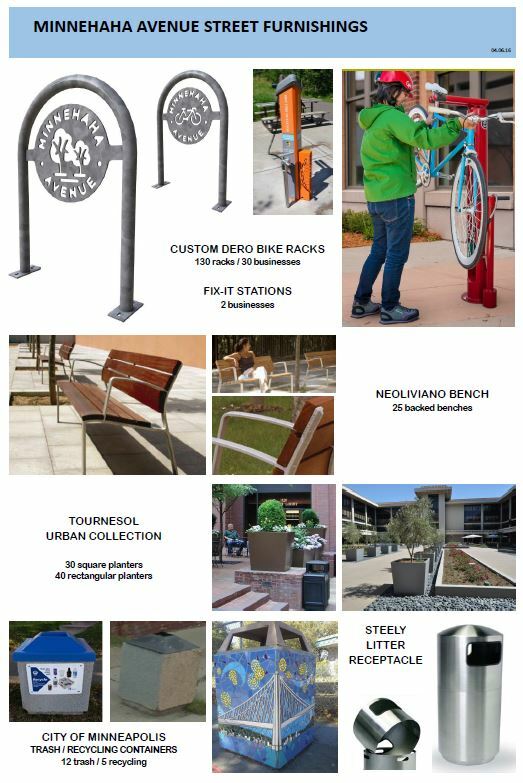 Expect to see almost 50 new bike racks, 11 benches, and 35 planters in front of businesses in the area before summer. Litter receptacles, recycling bins, and bike repair stations will be coming later in the year. Update April 7, 2016: Metro Transit has posted a revised detour for the Route 7. Northbound buses will travel regular route on Minnehaha Ave to 38th St, left on 38th St, right on Hiawatha Ave, right on 33rd St, left on Snelling Ave, right on 32nd St, left on Minnehaha Ave and resume regular route. Southbound buses will travel regular route on Minnehaha Ave to 32nd St, right on 32nd St, left on Hiawatha Ave, left on 38th St, right on Minnehaha Ave and resume regular route. Buses will not make stops on Hiawatha Ave.
March 31, 2016: Year 2 of Minnehaha Avenue’s reconstruction will begin April 4. Construction will start with the area between 34th and 38th streets (stage 3). Stage 4 construction between 34th and Lake streets is expected to start in July. Traffic detours around the construction area use Lake Street, Hiawatha Avenue and 42nd Street. Work will begin at 34th Street and progress to the south. One lane of traffic will be available for local access (though it may be a gravel surface instead of paved surface). All intersections in this area, with the exception of 34th Street, will be closed for approximately 10 days for reconstruction work during this stage. Adjacent intersections will not be closed at the same time. Stage 3 work between 34th and 38th streets is expected to wrap up in July. Construction will then progress to the final stage between Lake and 34th streets. The Project Team will be holding an Open House to share the latest information on the project and to answer your questions. All are invited! Date: April 6 from 3:30 to 6:30 p.m.
Northbound buses will detour to Hiawatha Avenue at 40th Street and rejoin Minnehaha at 32nd Street. There will be no northbound bus stops between 40th and 32nd streets. Southbound buses will relocate to Hiawatha Avenue at 32nd Street and rejoin Minnehaha at 42nd Street. There will be no southbound stops located between 32nd and 42nd streets.